VirtualBox 4.0 is out now. Most importantly, it supports Unity as well as Gnome-Shell in the Virtual Environment. For a complete list of changes, please take a look at changelog here. The output should be 'OK'. 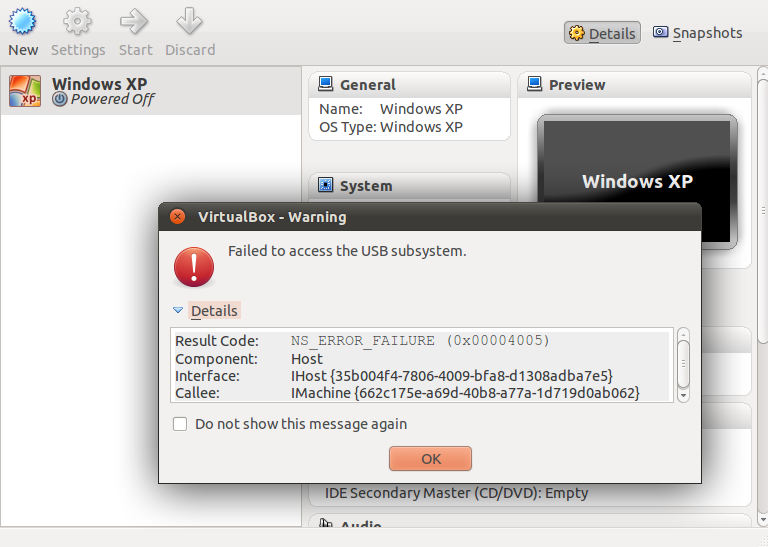 Some common problems with VirtualBox in Natty are listed below. Once installed, you can access VirtualBox from Applications > Accessories sub-menu on Ubuntu Classic and by pressing <Super> and searching for VirtualBox in Unity. After creating a new machine, when you click the 'Settings' button in VirtualBox main window to make some changes, most of the times you are greeted with the error message shown in image below. Somehow, the User Privileges don't get assigned correctly. The solution is to press the <Super> key, type 'Users and groups' and open it. In the Users and Groups main window, click 'Manage Groups' and look for the 'vboxusers' group. Highlight it and click properties. In the new window under members, enable your account. Close it. Once again on the Users and Groups main window, click your username and then click 'Advanced Settings'. Go to the 'User Privileges' tab and scroll down to the bottom where you see this option. Make sure it is enabled. A reboot would be enough to make the error disappear now.